I really wanna know ... who are you? 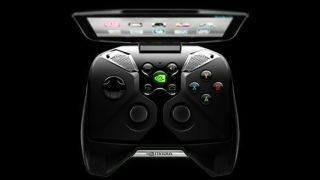 A new challenger to the Nvidia Shield? Asus may be preparing to launch an Android gaming console or handheld of its own. A mysterious device named the Asus Gamebox appeared in a newly published listing by folks at AnTuTu benchmark. While the benchmark did not come with an accompanying image of the device, the Asus Gamebox specs already look strikingly familiar to the Nvidia Shield. It appears to feature Android 4.3 powered by a Nvidia Tegra 4 ARM Cortex-A15 processor, 2GB of RAM and 8GB of built-in storage. The tip off that makes this device seem like an Nvidia Shield rival is the accompanying line item for a 1280 x 720 resolution display. What has a screen and Tegra 4 processor? There's no mention of display size, but the Asus Gamebox could likely be a combo controller and screen device rather than an Android home console such as the Ouya or MadCatz Mojo. An accompanying AnTuTu benchmark 4.0 test even directly compares the device with the Nvidia Shield. From the test, it looks as if the Gamebox is just slightly ahead of the Shield in most regards except for the 3D Mark score and RAM. There's still no telling if this device will indeed be an Nvidia Shield rival or another type of Asus device. Another potential theory is this mystery device could be the Android-powered Nexus TV set-top box rumored last December. For now we can only take stabs in the dark until Asus announces something more official. But as soon as we hear more you'll be the first to know, so stay tuned to this space. If you want to get more mobile gaming into your life, here are the 10 best tablets.